If you have any questions or want to enquire about dates, use our form to contact Lorna Bourke or see their website for more information. Gallán Mór – ‘Big Stone’ – named after a huge piece of rock inexplicably lodged in the back garden, bestows a sense of history on this otherwise beautifully contemporary place to stay. Overlooking the glistening blue of Dunmanus Bay are two immaculate white cottages: the house where Lorna and Noel do B&B, and a self-catering pad for six next door. Both are topped with slate roofs and dormer windows, and surrounded by landscaped lawns laced with meandering paths and hidden corners. The four beautifully furnished B&B rooms would look at home splashed across the pages of a glossy designer mag: stunning four-posters, chandeliers that twinkle between the eaves, the occasional olive-green wall. The spotless cottage is just as delightful, with restored antique radiators, comfy leather sofas and a cosy wood-burner in its open-plan living room. Caribbean Lorna and Irish Noel are a beaming, sunny, ex-London pair. The area is full of quirky villages to explore and stunning walks; and there’s a hot tub for the idle. Christmas, 30 September - 16 March. Thanks to Lorna and Noel, it was a five-day stay in paradise! Comfortable beds, well-appointed rooms--all with views!--and sumptuous breakfasts were only part of the package here. Lorna and Noel welcomed me like a friend back for a visit. On arrival, we sat with a pot of tea and orange/almond cake talking in the garden overlooking Dunmanus Bay. They booked dinner reservations, gave me tips on where to go. This is the first, I hope, of many trips to Gallan Mor! Five nights of absolute bliss. This will be the first of may visits to Gallan Mor, where I was welcomed not as a stranger but as a long lost friend. After a long day on the road, I finally arrived in ... heaven on earth, a house overlooking sun-sparkled Dunmanus Bay. Lorna and Noel took me in, made a pot of tea, and we all sat in the garden sipping and savoring Lorna's Moroccan orange almond cake. That was merely the introduction to Lorna's baking savvy. The Dutch babies are nothing short of addictive, and their hospitality and recommendations made this a very special trip indeed! Gallan Mor was a gem of a find. We had a very well appointed room offering spectacular views in a lovely peaceful part of the delightful Irish countryside. Our hosts were most welcoming and attentive. Happy to help by booking restaurants and with advice on places to visit. Our breakfasts were delicious with plenty of choice, cooked to perfection and with fabulous homemade breads and preserves. Thank you Noel and Lorna for a very pleasant and relaxing stay. Bantry House. 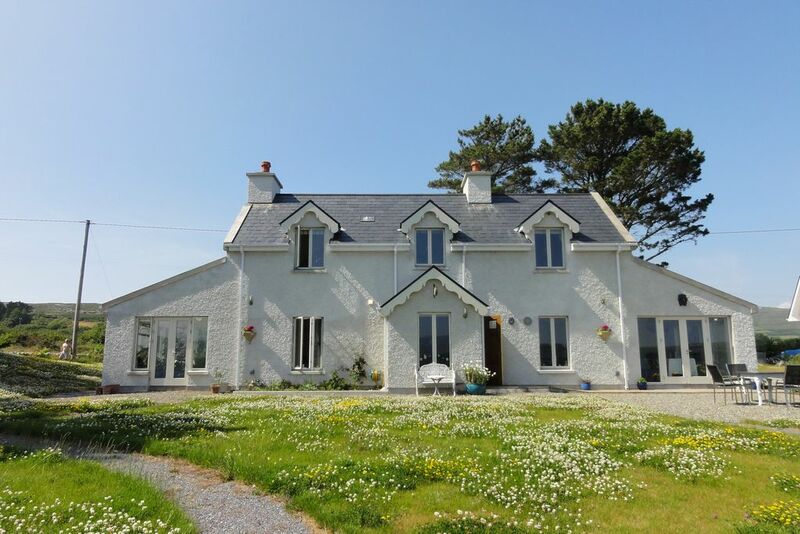 Explore this great and historic house, climb the 100 steps and take in the view over Bantry Bay. Cream tea in the garden is a must! The Sheep’s Head Way walk & Pilgrim pathway. Blue Flag sandy beaches on the Mizen Head.